There a lot of common superstitions and traditions connected with practically every aspect of your wedding (regardless of when or where you are tying the knot). 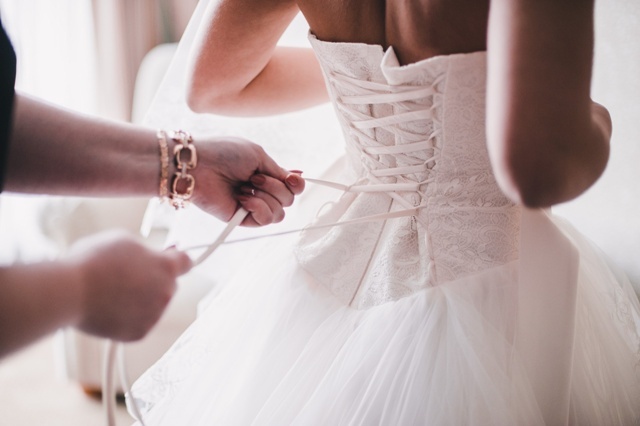 We’ve gathered 4 of the most famous wedding dress traditions and superstitions that will put a smile on your face when/if you come across them in your fabulous wedding dress on your big day. 1. Grooms, no peeking at the bride in her wedding dress before the wedding! 2. Let’s hide the bride’s face under a veil till the last minute at the altar! The reason behind this tradition/superstition is similar to the reason behind the no peeking at the bride in her wedding dress rule. The veil, except for symbolizing the bride’s innocence and modesty, was in the past used as a weapon against calling off the wedding. In the past, as the bride and groom weren’t allowed to meet each other before the wedding, the bride’s veil was kept upon her face till the very end of the wedding ceremony (right before the “You may kiss the bride” part), so that the groom was left with no other choice but to get in terms with the way his new wife looks. Back in the past in England, it was particularly considered a good luck to find a spider in your wedding dress. While spiders are recognized worldwide as good luck bearers, we still can’t accept finding a spider inside a beautiful and delicate designer wedding dress as a good omen. Nevertheless, if you believe in old English tales, be prepared to shout “Hurray!” if you happen to find an eight-legged bug in your fancy wedding dress. Did you know that the traditional wedding dress color was… red? It was not until 1840 that Queen Victoria set the beginning of the white wedding dress tradition that has been followed ever since. By the time she got married to Prince Albert, white had been the compulsory color for court dresses – the dresses which young ladies used to wear when they were first presented at court.